This large, dark-backed, pink-legged gull is common along the U.S. Pacific Coast, where it is characteristic of the California Current coastal upwelling ecosystem. Heavily built and broad-winged (typically showing a skirt at rest). Bill typically stout and bulbous tipped, but relatively slender on some females; compared to Glaucous-winged Gull, bill of Western often looks shorter and more bulbous-tipped. At rest, tail tip about equal with or slightly shorter than tip of P7. Adult has slaty gray upperparts (Kodak 8-11, see Taxonomy) and reduced dusky head and neck streaking in basic plumage. Juvenal dark brownish overall with solidly blackish tail. PA1 starts Sept.-Nov. Subsequent ages variable in appearance. All ages have pink legs; adult eyes pale to dusky; orbital ring chrome yellow. No other large dark-backed gull occurs regularly in its range, so older immature and adult Western Gull normally distinctive by virtue of slaty gray upperparts and pink legs. Most similar species are Slaty-backed Gull (N. Pacific) and Yellow-footed Gull (Gulf of California). In first cycle also see Herring Gull, and note that hybrid Western X Glaucous-winged Gulls show various combinations of parental characters - and can also resemble other species (see hybrid account below). darker-backed (Kodak 9.5-11) wymani (Southern Western Gull). 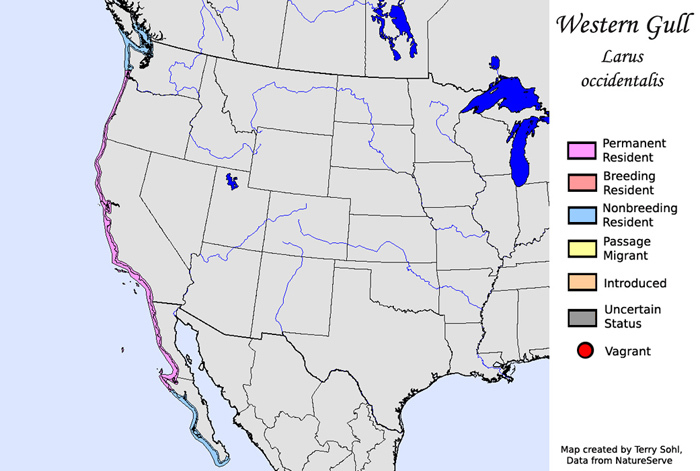 Northern occidentalis hybridizes commonly with Glaucous-winged Gull in Washington and Oregon (see Bell 1997; Hoffman et al. 1978 and Scott 1971), and some authors consider these taxa conspecific (see Weber 1981). Yellow-footed Gull of Mexico formerly considered a subspecies of Western Gull (see AOU 1957). W. N. America; accidental in Hawaii. Breeding. Common to fairly common resident (breeds Apr.-Aug.) on Pacific Coast and islands from s. Wash. (north to Cape Flattery) south to Baja Calif. Peninsula, Mex. (south to around 27° north). May breed sw. B.C., but distinguishing pure birds from hybrids with Glaucous-winged Gull is problematic. A few pairs have bred since 2001 in n. Sinaloa, Mex (Gonzalez B. et al. 2003). Nonbreeding. Fairly common to rare non-breeding visitor (year-round) north to sw. B.C. and Queen Charlotte Is., south (mainly Sept.-Apr.) to the tip of Baja Calif. Peninsula, Mex., and rare but increasing (year-round) in n. Gulf of Calif. Rare visitor north to se. Alaska (mainly Sept.-Mar. ), exceptionally north to Bristol Bay (June), and casual (Jan.-June) south along Pacific Coast of Mex. to Oaxaca. Uncommon to rare in protected marine waters of Wash. away from the coast, ranging in fall and winter up Columbia R. to se. Wash.; rare inland in Ore. away from Columbia R. In Calif., generally increasing in inland valleys near the coast, especially in Los Angeles Co. Rare (mainly Sept.-Mar.) in Sacramento Valley and rare but increasing at Salton Sea. Casual in Calif. east of Sierra Nevada (scattered records year-round). Farther inland, casual at best (mainly Oct.-Dec.; also Apr.-May and July) with scattered reports east to s. Lake Michigan (Wright and Komarek 1928) and se. Tex. A bird that ranged from Ala. to Fla., 1977-1990, was thought by some to be a Western Gull (Duncan 1982), but many believed it may have been a hybrid (Stevenson and Anderson 1994). Western Gull occidentalis C16 adult, February 14 2016, Stow Lake, CA. Picture: Rudyard. Western Gull occidentalis adult, February 23 2017, Pacific Grove, California, USA. Picture: John Cant. Western Gull occidentalis adult, February 17 2009, Beaverton, Oregon. Picture: Greg Gillson. Western Gull occidentalis adult, February 14 2009, Portland, Oregon. Picture: Lyn Topinka. Western Gull occidentalis adult, February 09 2012, Seaside Cove, Oregon. Picture: Lyn Topinka. Western Gull occidentalis adult, February 02 2006, Crystal Cove, Orange Co. Picture: John Avise. Western Gull occidentalis adult, February 14 2009, Portland, Oregon. Picture: Lyn Topinka. With Olympic Gull.